Imperial Racing's Plus Que Parfait didn't put his best foot forward in two Kentucky Derby (G1) points races at Fair Grounds this winter, but the Brendan Walsh pupil shipped halfway around the world to book his ticket in Saturday’s $2.5 million UAE Derby (G2). Adding blinkers and picking up Jose Ortiz, Plus Que Parfait rallied to edge fellow American shipper Gray Magician and earn 100 points toward the Kentucky Derby. The all-American exacta marked a change of fortune in a race that had never before gone the way of a U.S.-based sophomore. 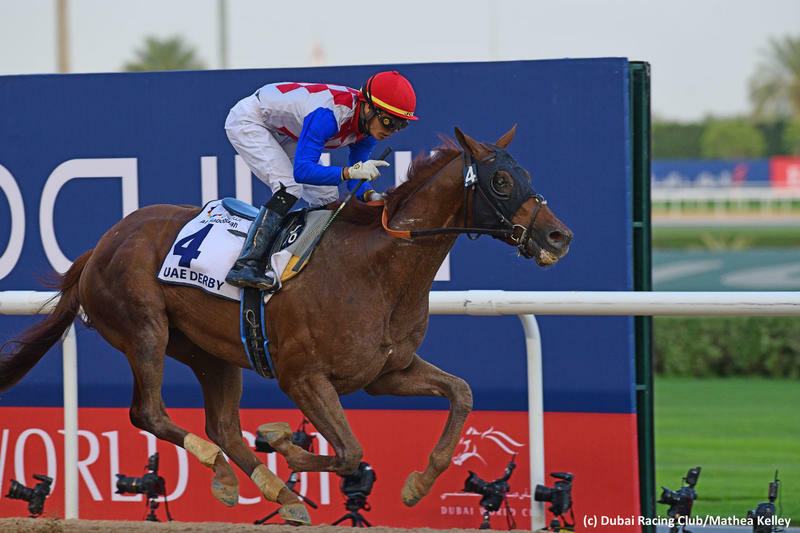 Godolphin was expected to hold a strong hand with the filly Divine Image, who was favored off victories in the UAE Oaks (G3) and Al Bastakiya, but she faded from her stalking spot turning for home and beat just one rival. Locally based colt Manguzi, a distant third to Divine Image last time, tracked the pace and struck the front in the stretch, only to be confronted on both sides. Gray Magician was bearing down on the outside, while Ortiz steered Plus Que Parfait to the inside, and they overtook the hard-trying Manguzi. Plus Que Parfait found a bit more than Gray Magician, pulling away by three-quarters of a length. The runner-up took home 40 Derby points for trainer Peter Miller. Manguzi, admirably consistent through the Carnival, garnered 20 points in third. Derma Louvre, who has also scored points on the Japan Road to the Kentucky Derby, grabbed fourth for 10 points on the main leaderboard. By negotiating about 1 3/16 miles in 1:58.41 on the fast main track, Plus Que Parfait improved his record to 7-2-1-2. The $1.5 million winner’s check now comprises almost his entire bankroll of $1,590,400. The Keeneland maiden winner was a closing second in last November’s Kentucky Jockey Club (G2), beaten only a neck by Signalman. A troubled fifth to War of Will in the Lecomte (G3), he was 13th behind the same rival in the Risen Star (G2) in his latest. Plus Que Parfait was bred by Calloway Stables in Kentucky and sold for $135,000 as a Keeneland September yearling. He’s by turf star Point of Entry out of the Awesome Again mare Belvedera.